Montgomery County’s Steven Harsman does acknowledge that the names of dead people have shown up on petitions gathered to get candidates and issues on the ballot. But, he says, “They get deleted, because their signatures don’t match” the signatures on their registration forms. Even if just a few people are signing another’s name, that’s not good. via Editorial: Dead people aren’t stealing any elections | A Matter of Opinion. 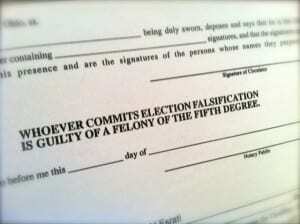 Now, either Harsman is lying about people turning in signatures of dead people- or he is guilty of not doing his job. He’s sure good about keeping live people off the ballot with his team of crack graphologists– where is the prosecution of the crimes? Have any of the party faithful been elected with signatures of dead people on their petitions? It’s time for a full investigation of the BOE- and who is on the payroll of this political patronage cesspool. It seems to me that it would be difficult to prosecute dead people? Furthermore, if the criminals sign with another name… how does one track back the forger? David knows better than anyone the credibility requirements of proper signatures on petitions. So start the trace backs with the CANDIDATES! Where were the signatures obtained? At what event? When? Who is the collective audience, geographically speaking, neighborhood and community activists etc. Stop the Fraud. There must be a better way … to run this railroad? It sounds like your saying there should be a criminal investigation for each petition signature that is rejected. That seems like a huge waste of time. The ballot is what really matters, not petitions. @Bob- it’s the person turning in the petition- who has sworn that the signatures are legit- that is prosecutable. As to the ballot counting- only if you can get on it- which in Dayton is less than 2/3 of the time. @ David – Agreed – only HOW do you find the people who obviously Lie, and sign Dead Mans’ names? There is not a simple way… so I was being facetious. As Clayton says, how to you possibly prosecute all the liars and forgers on the petitions. Hence Montgomery County’s Steven Harsman needs to change the petition process (andI KNOW you agree) – OR scrutinize the Candidates? When all of these “allegations” have been reported to the Secretary of State, what comes of it ? A Investigation needs to be conducted by the Secetary Of State. Huested is probably unwilling to investigate his friends in Montgomery Co. If enough people write letters to the SOS, explaining what they know, what crimes were committed. The SOS would be forced to take action. Many employees are afarid to expose the adminastaration in fear of retalelation. So many crimes by both parties have occured that people will probable end up in prision if exposed. Lucas Co. Board Members and their Director/Depty was required to resign this year bc of the SOS, that needs to happen in Montgomery Co. Voters have short memories and I wouldn’t be surprised if nothing happens, unless the SOS will get involved. I’m sure there is a room full of current/former employees that could verify all mentioned above true. And much much more. I have heard several staff have sent complaints via email over the last few years to the SOS but that may have been when Brunner was in charge. Does David know if there if there are official procedures people can follow to make a complaint and get the SOS to investigate? I really think the problem is with Jon Husted. If the comments posted on this blog alone were sent to him by Esrati how could he not do something? I also have some documents that show how both directors really screwed voters in a general election I think I might release. I can’t believe the democrats let Steve Harsman get away with having a public affair with his secretary, they usually clean their own house. Is the labor union board member Ritchie that backs this Harsman guy up really that powerful? I can’t beleive nothing has been done. Congrats yo the BOE for screwing up one of the two gotta work days by passing out the wrong poll books and supply bags to wrong precients disfranchising hundreds of voters! who you going to blame now betty and steve? how about the both of you!